A hula hoop is an inexpensive way to decorate a little girl’s bedroom and make her feel like a princess. A canopy bed may sound exotic and quite expensive, and so it is if you buy a ready to hang hula hoop canopy. However, you can make a canopy of your own for a lot cheaper. The best thing about making your own canopy is that it is completely customizable and you can alter it according to the personality of your little girl. To create the canopy, start with the hula hoop. You can choose any size, depending upon your preference, but remember the larger the better. Cover the hula hoop by wrapping the ribbon around it. Decide how you want your hula hoop canopy to hang. Most of the time the canopies open at the foot of the bed, but it is better to open it on the side, since it will allow easy access to the bed. Also decide the place to mount the canopy on. You can mount it anywhere on the bed but it will droop best if fixed in the centre. Install the Cinderella hook by screwing it in. Cut the tulle into pieces of 8-10 feet length, depending upon the height of your ceiling. Wrap the tulle pieces around the hula hoop and fix them using the fabric glue. Cut the ribbons and glue them around the top of the hoop, allowing them to hang down against the tulle. Tie the hula hoop to the Cinderella hook with a double knot. Spread out the bottom of the canopy so that it completely covers the bed area. Glue colourful silk flowers and bows around the top to make your canopy more colourful and exotic. 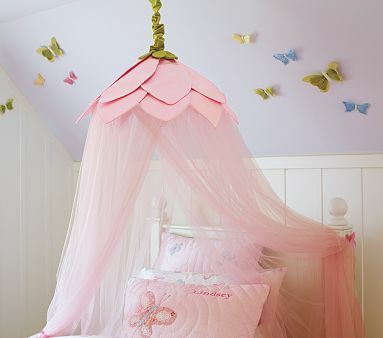 You can also add additional decorations like butterflies and glue sparkles to your canopy.